Yujin came all the way from Japan to be part of Attollo! Actually, he moved here when he was 12, but we’re pretty sure it was all part of his plan to begin working here after graduation. He is a Lampeter Strasburg graduate and earned a Bachelor’s Degree in Graphic and Interactive Design from Temple in 2017. He had 3 Graphic Design internships throughout his educational career. At LS he played soccer and played the trumpet in the marching band. He’s always up for a game of soccer, volleyball, or ping pong (don’t be surprised if we have a ping pong table in our lobby the next time you come!). And you know what, he does origami too! Yujin is the master of all things graphic at Attollo and he works tirelessly (or sometimes tiredly…like till 4:00 AM for example) to ensure perfection. 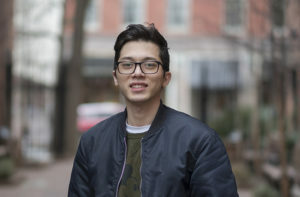 Yujin lives at home in Lampeter.